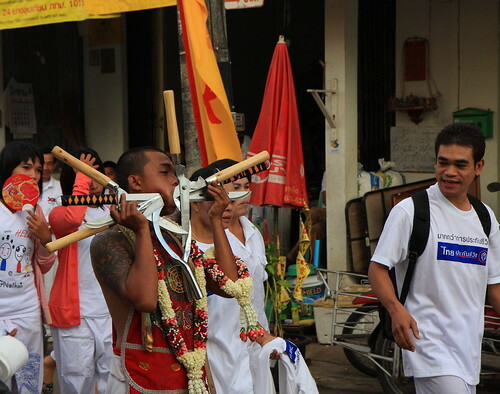 The vegetarian festival in Phuket is a special event that takes place every year and attracts visitors from all over the world. If you think a vegetarian festival sounds like a pretty boring idea, you’re completely wrong on this one. It’s not just a vegetarian festival – it’s so much more and is a tradition that is honored by people of Chinese ancestry since 1825 in Phuket. During this period, people invite Gods and Goddesses into their body – and perform seemingly impossible acts like sticking needles, knives, long poles and other things through parts of their body, especially their faces. The people who perform these rituals are called “Ma Song”. You can also see how worshippers walk barefoot over hot coals. They take baths in hot oil and climb latters – but the steps are made out of sharp blades. The reason why they don’t eat any meat or animal products during this time is to honor two Chinese dieties: Kiew Ong Tai Teh and Yok Ong Sone Teh. It is quiet an intense festival, and there are many things to tell about it. So if you come to visit, make sure you bring a personal tour guide with you who can tell you the stories, the history and meaning in more detail than just a guidebook or website. This year it will take place between 27 September to 05 October 2011, so if you are in Thailand during that time, it’s a great opportunity to see something truly special.